Spring Break is underway for us. Break always means we have fantastic sunny weather the week before or after break, and drizzle-wet-yuck during. No plans other than a fun activity every day with my girl. 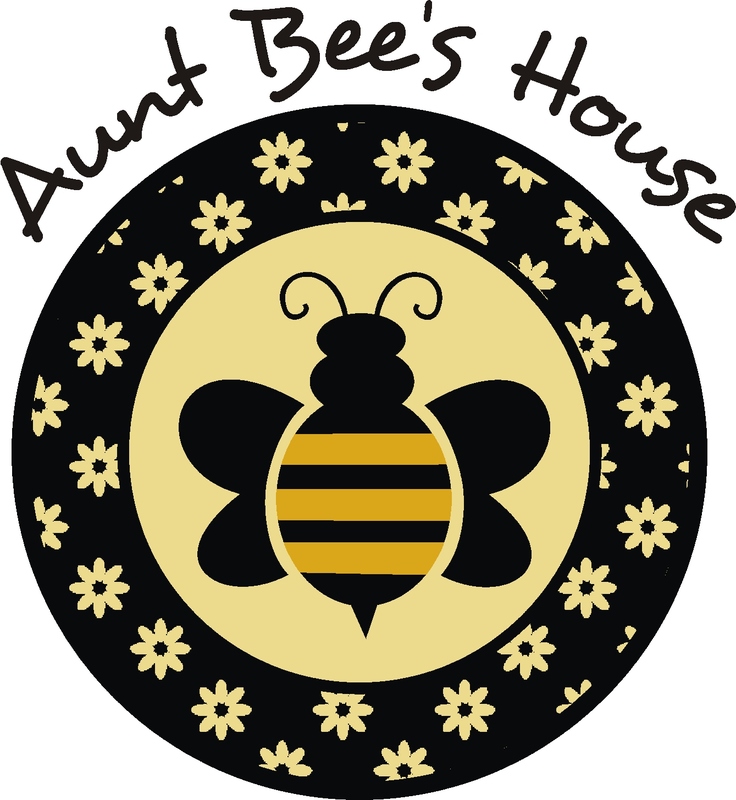 We have a big trip planned in a few short weeks, so we're staying local for now. Yesterday I got to work on a mirror that I purchased from a thrift shop a few weeks ago. I loved the shape of it and it was in good condition, so I snagged it. I have a weakness for mirrors! I have four in the works right now! Here was the before. It was pretty grody. Lots of bits of food and sticky stuff all over it. After giving it a thorough cleaning I went to work on it with my vintage sheet music and Mod Podge. I had originally planned to paint it a single color, but just thought that would be too boring for this. I'm so glad I went with plan B. Playing up the lines of the mirror, and the graphic nature of the sheet music really brought out the details on this. I won't be keeping this one, although my husband likes it so much he wants to! Last weekend I went to some tag sales with my friend Janie, and we decided to end with a trip to Goodwill. Anyway, I walked away with a cart full of good stuff! This is a good thing, because I really needed to find some things for the show I'm trying to get into, and my Etsy shop is running low on items. So I went back with Janie, and asked her what she thought- the frames were very unusual, but I love turquoise, so for me it was the highlight. She thought they were interesting, so I came home with them. I could tell the art was good. I did my research, and I'm glad I got them!! 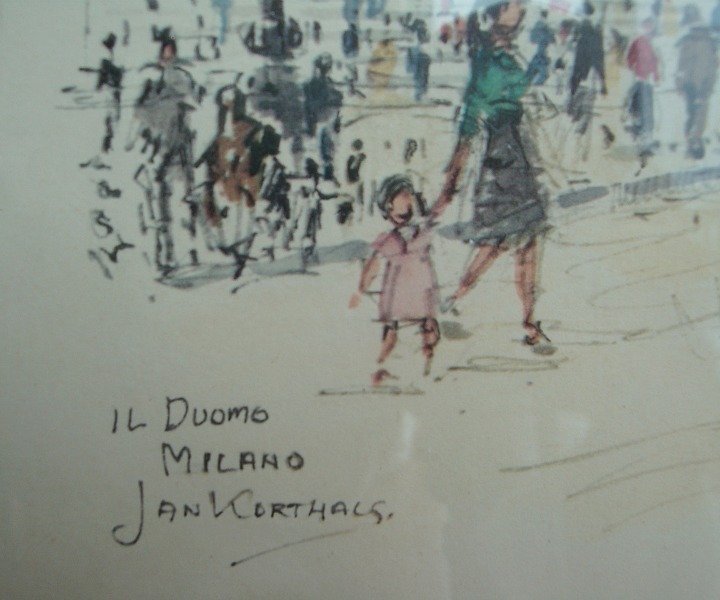 Jan Korthals was a Dutch impressionist working in both oils and pen and watercolor. The two I picked up are prints- not originals, but even so, they aren't Goodwill prices when they sell! Do you recognize either of these? I can't find much on these particular two, but it's fun to find out that a hidden gem was found in the aisles at Goodwill! The framing alone is a work of art! They both have some pretty serious scratches at the tops of the frames, but I think with some light sanding and some touch up with paint, they will look good as new. Thanks for letting me share my project and thrifty find. I hope your Spring brings you lots of sunshine and hope! the mirror turned out great love the sheet music and the pictures and frame are a great find. Nice frames! Love it when you find things that speak to you. Denise those are wonderful!! I love the frames as much as the subject. How lucky for you! Wow! I love what you did with the mirror. Sheet music always makes things pop and look so interesting. Great job! Your GW pictures are wonderful...love that turquoise. Yep, I know what you mean; you only regret the things you don't buy. Glad you listened to the inner whisper. The mirror was pretty to begin with! But after the music was added it turned into "stunning"! Everyone who looks into your mirror will have the mirror dance in music back to them! I don't know anything about the prints but they are SUPER cute! Goodwill is the best place to find little treasures like that!! Ahhh, I'm a Goodwill Gal too! I love what you've done with the mirror! Just beautiful. Are you sure the prints are of an Italian Cathedral? I thought they looked almost French. Do a google search on Italian and French cathedrals. They are lovely finds and the frames are great! I love what you did with the mirror. It's whimsical and elegant at once. Don't you love finding treasures like those paintings at the goodwill, that's why it's my favorite place to shop. VERY, VERY nice job on the mirror Denise! That is just beautiful! i think you should keep the mirror too. it looks lovely. Okay; that mirror has the WOW fACTOR! It's just so eye catching. Love the mirror...such a creative idea!! Denise, I LOVE the mirror! I don't think I could part with it! And I love good days at Goodwill and it always goes like that....don't find a thing for weeks and then Jackpot! Just found your blog, love it! I am a follower! Your sheet music frame is stunning! I said "wow" out loud when I saw it! You did a beautiful job. Stunning is the word for that mirror...I would so keep it! Thanks for coming to my party!!!! I just found you! I love what you did to the frame!!! And I can see why you loved those pictures! Denise your mirror is gorgeous!! 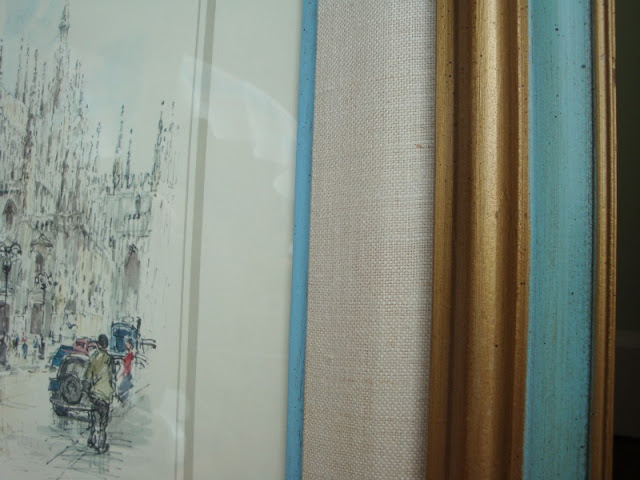 I love the music sheet paper and the way you highlighted the lines of the frame, if you don't keep it I am sure that it will go fast! Great finds too, those prints are so pretty. I hope that you have a good spring break, that seems to be the story we have during break with the weather. I love that mirror. The vintage sheet music looks wonderful. 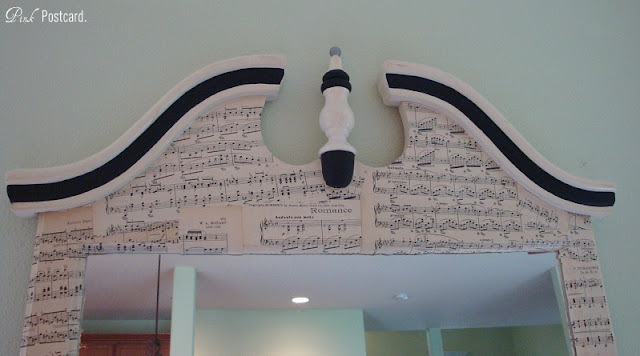 I think vintage sheet music looks good on everything! I just finished a project using some myself. The frames and prints were a great find! I really like the turquoise in them. Hope you and your daughter have a wonderful spring break! Have a great spring break! Love the mirror, very creative! That mirror is absolutley fantastic and so are the prints. Love your mirror. Everyone else just does the cream or white with the sheet music, so I love that you made it different with the black details. Very pretty prints too. Loving the frames on them. I know what you mean about Goodwill. The one in my area is horrible. Everything is broken or chipped, and worse yet, they practically charge what it would cost to buy a new one at the store. I don't know who runs our store, but thank goodness for the other more affordable thrift stores in the area. Your mirror looks awesome! I have a Goodwill mirrir that I am in need of re-vamping - thanks for the inspiration! Love what you've done with the mirror. Those prints and frames are just beautiful. And I really like the colour of your coffee table. So pretty. Love the mirror and love that painting. I have been there in person. 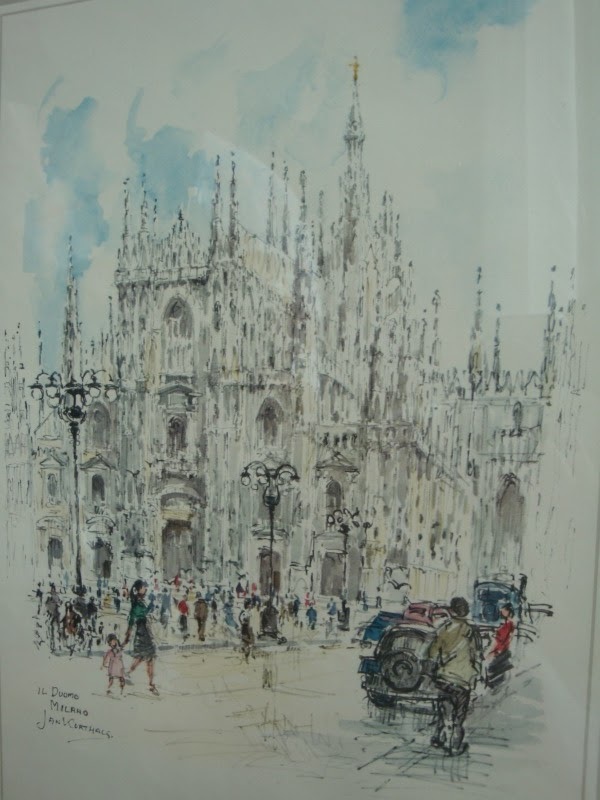 What a beautiful painting of the duomo. Great frame, too. Thanks for joining WUW. I love what you did with the mirror. 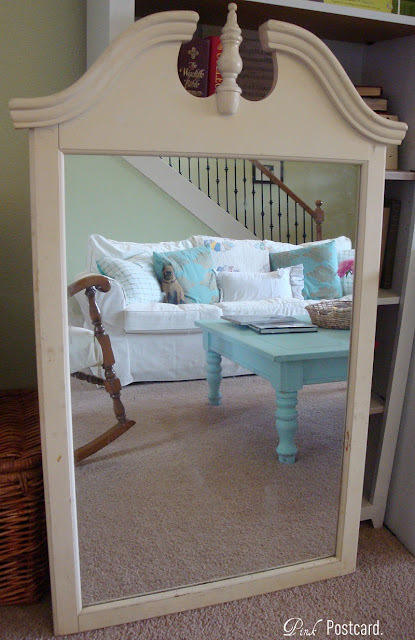 I bought a similar mirror from a thrift store a couple of months ago. I got so far as to tape off the mirror part but couldn't decide on the finish, so here it still sits in my workshop. 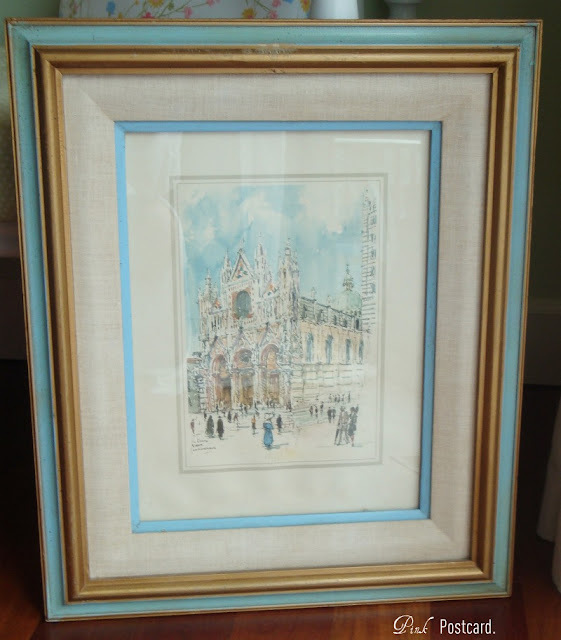 the one print is the Cathedral in Milan- "Milano." The second, I know I've been there, but I can't place it. If it's labeled like the other one, I could probably tell you. They are BEAUTIFUL!!! I'm so jealous! They are exactly the type of print I love to collect of European places I've visited. Did you hear my gasp of awe from where you are? Love it. I will be featuring it tonight on Motivated Monday at BeColorful. Thanks for linking it up. I love your mirror! 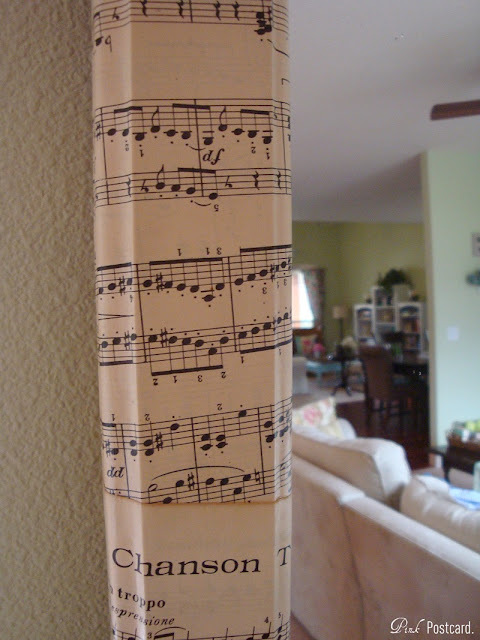 That's a fresh new take on using sheet music. And good finds. I'm following along. Looking forward to getting to know you! The second print is of the cathedral in Milan, Italy. It is kind of a wedding cake style. The first one could be the duomo (cathedral church) of Siena. The image is too small to read the writing. Love the pictures and the framing. They look mid-century. Good find! 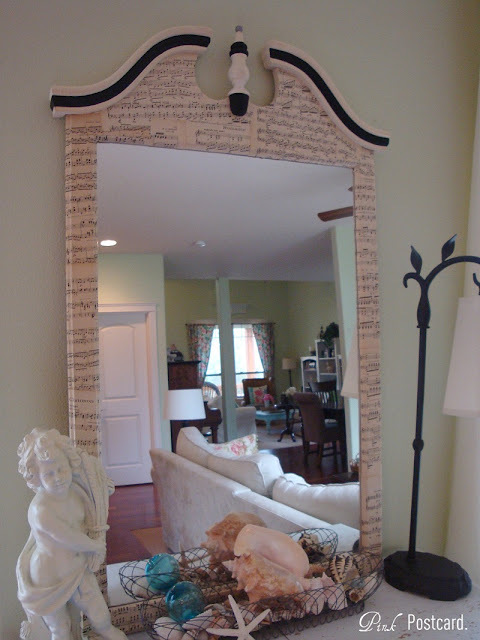 great finds and love what you did to the mirror--so creative and really transforms the vibe from something so colonial. thanks for visiting recently!